We look at some inventory from Town and Country Event Rentals with three different style of weddings combining wooden long tables with round tables covered with linen. Combining shapes, textures and even chairs, can create a unique and characteristic design for your wedding, to match your personality. With a myriad of inventory Town and Country Event Rentals is sure to have your style available to decorate your special day your way! At the iconic Santa Barbara Historical Museum, funky, eclectic decor combined a bright orange and sea foam green color palette. The distressed folding chairs and rustic rectangular wooden vineyard tables combined with round tables covered with TuscanyAqua and Saffron linens La Tavola Linens provide a polished picturesque diverse motif. Planned and designed by Felici Events and Photographed by Nancy Neil, you can view more of this Eclectic Orange Wedding by clicking HERE. A Latitude 22 Bamboo Lantern Tent is sure to be a show stopper, not only because it houses the cocktail hour wooden bar, but because it literally stands 23' high truly a one of a kind design element! At the reception dinner held inside the Bacara ballroom long family style tables with garlands are mixed with round tables draped with elegant dupionique La Tavola linens. 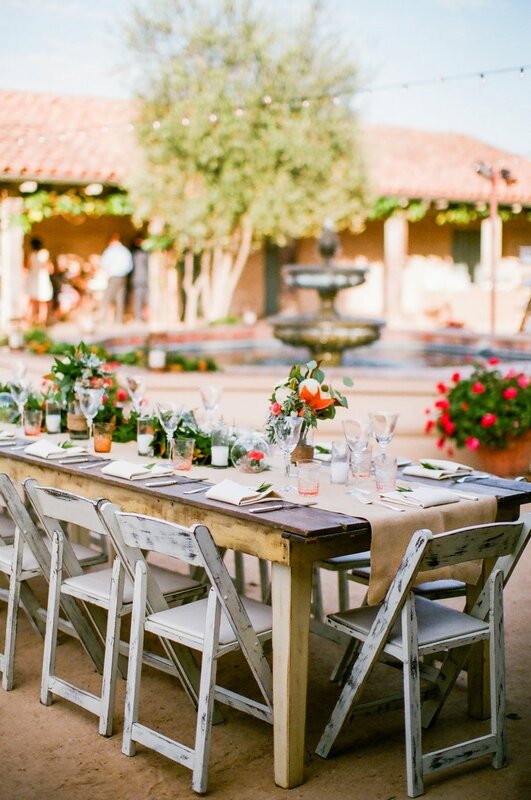 The Vineyard Cross Back Chairs are modeled after the a popular European café chair in Europe, and can be used with both a casual farm-style and a formal weddings, like this one. Planned and designed by Alexandra Kolendrianos and Photographed by Megan Sorel Photography, you can view more of this Eclectic Orange Wedding by clicking HERE. 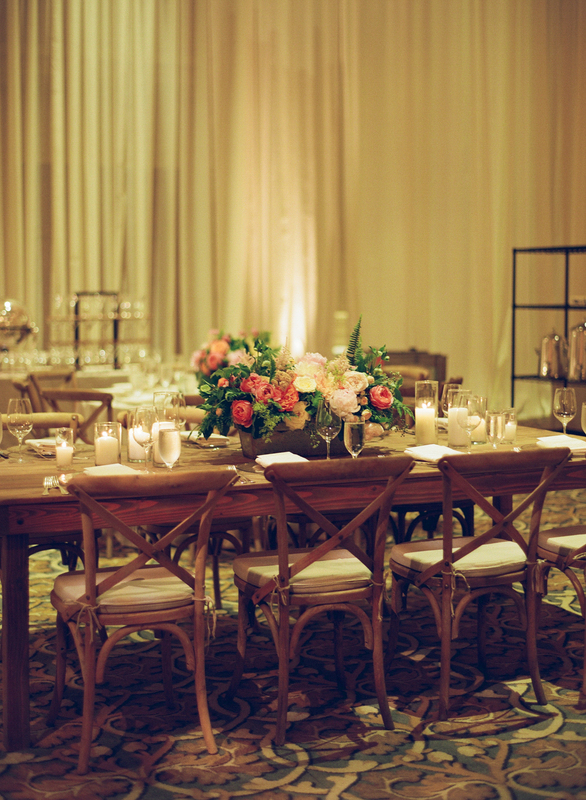 At a private estate wedding reception, the luxuriously elegant wedding exudes a casual elegance. The tufted lounge "Manhattan Furniture Collection" decorated with a tray crystal vases and flirty pink roses provide an upscale area of the reception. Then the mix of long and round wood top tables tables accompanied by a mix of "Vineyard Cross Back Chairs" and "Vineyard Dining Chair with Cane Back" add a visually appealing eclectic combination. The classic hemstitch runners and napkins pair well with the lush floral and overhead draping of the tent to create a balance of non-chalant and formal. Designed and planned by La Fete and photographed by Willa Kveta, you can view more of this pink and green wedding by clicking HERE.